Just landed is the first full production ‘Nitro’ from Mirage Model Yachts. An evolution of the successful Cheinz and Mojo designs the brand new Nitro is being packed to go to the IOM worlds in France this May. Featuring Australian Mirage Foils and Hales blocks this Aussie design also uses the great RMG sail winch and is now in full production and sailing! The Nitro will be available as a Hull and foil set exclusively from RadioSailingShop and as a complete boat with 1,2 or 3 rigs ready to go, from Mirage Radio Yachts. This marks the relaunch of the Mirage Brand in Australia with a bigger and quicker delivery capability. Mirage also continue to make Rg-65s, 10Raters and Marbleheads, with more new boats coming soon! -more room, less boats or more sailing? Fly has just landed his awesome new orange Ian Vickers V10 and is off and sailing, heres the club and sailing area also! Batteries are accessed through the round clear hatch, to remove servos the tape around the carbon fibre hatch allows plenty of access to the internal fittings and servos! RMG sail servo winch for most boats mounts up with 2 bolts, on the Katana and many boats they mount on a plate that then is fitted to the hull to allow speedy removal, here are before and after pics of how its done! Steering linkage is length adjustabe (part no. 66c) for centering rudder and making adjustments! -some more Star Pond Yachts! -What a stand! adapted from the classic french boat stand these are workign really well for Rgs and ioms. -Alans iom sailing at Twin Towns Radio Yacht Club Inc, see our links page! -In the boatshed, a wall of boats, and floor and ceiling and more! -Building swingrigs, some pics that may help you! Marblehead Swing rig, 14mm lower mast , SailsEtc mast 'T' block and 12.8mm alloy booms. -Jib boom hook tip, mainly on the rg65 jib boom swivel but stops you loosing the iom boom swivel hook also! -Here is my Katana, slowly getting up to speed, need more sailing time and more rigs! Alexandros inGreece has designed this lovely marblehead class boat and is racing it in Athens against other Marbleheads such as the Tenthys designed by Mark Dicks! Great result for Aristos , 1st place in the first regatta against 20 odd boats! Features SailsEtc marblehead keel fin and rudder with SailsEtc swing rig kit! Here is a great shot of Tim the Weed Cutter mans weed cutter being used to help get us sailing back on Albert Park Lake in Melboune Australia, once all the Formula 1 Grand Prix gear is gone hopefully we can get back sailing, too good a spot not to! And the view from upstairs at the bar! -More of my iom build, rmg winch with self tensioning drum barrel is mounted to a quick fit plate similar to the katnana above , however this servo plate slides into the boats structure typical on many ioms! The click in rudder fitting can be seen along with adjustable turn to tune rudder linkage no.66c. Boom vang No.15 has been used with 103t boom end fitting that has an added split pin to route cunningham around the mast. -Lilydale Lake sailing some nice home builds sail every saturday , why not go and have a look! -12 metre barn find, Austrlaia 2 the 1983 winner of the Americass cup kit, found an old one and a brand new in box kit! -Old rig box / new rig box, my old rig box transported some rigs to china so i built a new one higher to fit rg65s as well! -What is this old time boat, anyone have any ideas, the back one is an old english twin keel boat. -Rg65 weight comparisons from around the world for the technical minded, knock yourselves out! -Star yacht sailing, took one of our stock boats for a sail! -Garys gothic another great woodie, sweet boat! -Lincolns new Marblehead the F4, the current evolution of the successful fuzzy logic and f3 versions sailed by Dave Thomas. -Marblehead weight comparisons, once again, knock your selves out! -John goth and tippie canoe t50, great in cookie monster blue and the t50 with SailsEtc 12b Boom vang! 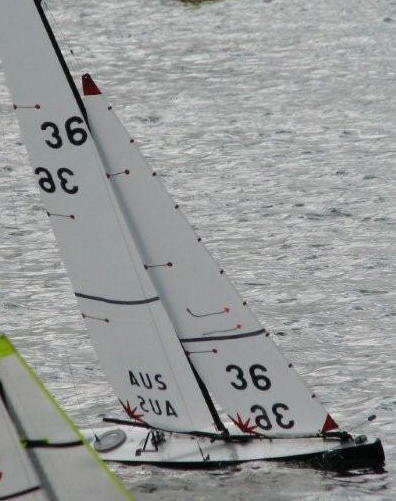 Albert Park Model yacht club have been sailing at Royal Brighton Yacht club, good waves and great view of our city! Hope the Ed Sheeran year is going well Brad!